After almost 10 years my son is no longer in education and has finally moved back home! Woohoo! We have done his washing, yes, ‘we’ … He put everything into separate piles and even offered to put it in the washing machine, or iron! Nothing was left in the hall for once, and he is helping with the cooking and shopping! In fact he allowed me to take him to Bluewater to get him some decent clothes for the summer! Very kind of him, don’t you agree!! Author thebissonPosted on May 31, 2012 Categories UncategorizedLeave a comment on Changes at home! I can’t believe that a whole week has gone by and I haven’t had time to tell you how my charity tea went! I managed to get the tea towels printed through the help of a fab chap in Folkstone and dashed over there on Tuesday afternoon to collect them. 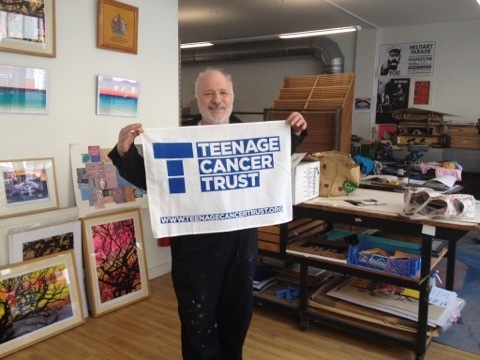 Nobby had done us proud and produced fantastic big towels with the logo just as I’d wanted it! Some of the committee popped round at tea time with more cakes, and we sat on my swing and enjoyed the glorious sunshine, whilst I kept spotting things I wish I’d done! Thursday dawned with fantastic weather!…well, let’s face it, with my Mother and Daughter nagging him God didn’t stand a chance on the weather front! My darling friends popped round to help and I had a ‘mild’ headless chicken moment when I couldn’t remember how to make icing for the cakes….yes, I know now how simple butter icing is, but I didn’t then cos of panic, OK?! Sandra came to the rescue with her vast experience of doing cricket teas and whipped up all we needed! 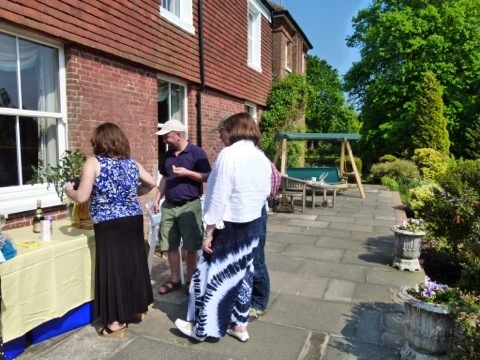 I was so grateful to the loads of friends and others who came to the tea party, spent money and enjoyed my terrace…I saw old friends I hadn’t seen for ages, met new ones visiting from overseas, heard stories of loss and recovery which made me want to hug everyone, and cry at the same time. My fantastic friends took over serving teas and cake so I could chat to people, and made the whole thing a huge success! We raised just over £700 for Teenage Cancer Trust, and I am so proud, and happy that my first charity do here was a success. It taught me to have a go again, and what wonderful friends I have…though I know that already! I think Ally had a great time too, watching us from wherever she is, knowing that through our fun we are helping to build special units so that other teenagers won’t have to go through the hell of hospital wards as she did, and will be surrounded by others in the same predicament. So thank you those who came, those who donated, and those of you reading this who will go to the Teenage Cancer Website to learn more from this site, and perhaps will help us. It has been a bit of an odd day or two. Saturday would have been our daughter’s 24th birthday. I remembered, but Hubby had forgotten what date Saturday was. The pain that produced inside me was huge. I haven’t felt that bad in ages. It’s not his fault, he’s very busy at work, and he’s a man, so he’s got two things working against him! Talking it over with my friends after our walk on the beach on Sunday morning one of them, who has also lost her daughter, she said the hardest thing is realising they are never going to walk into the room again…they’re not coming home. Then today I read an email from a friend who is going through hell as her daughter is suffering very badly from anorexia, and seems to be on a spiral downward. The pain has returned. My friend is going through some of what we suffered watching Ally die… And there is nothing I can do to help! Except be there, and send support. I want to just hug her so hard, but we live so far apart. So, my question is, WHY, Lord…. Why? Author thebissonPosted on May 21, 2012 Categories UncategorizedLeave a comment on Oh Lord, why? 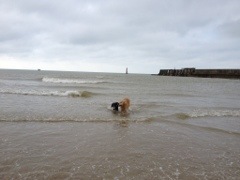 The day started so well… I went for a walk on the beach with 2 girlfriends and our dogs….tough on the old knees, but the back coped! Woohoo! We all had great fun and came back here for tea and rest. They tried my coffee and walnut cake and said it was fab. Yes, I know they could have been lying but they weren’t! Hubby said it was good too, so there! Then after clearing up all the sand form the kitchen I did the usual with the ironing, and got down to having another go at these biscuits, using the Pampered Chef’s Cookie Press – that biscuits to me! Here is what I managed after 2hours!! Look good, but not too sure they are worth it. I tried to do several sets, but it seems you have to perhaps fully clean the cookie press between each pressing ie every 10 or so cookies! Sorry, but that is just too fiddlie!! I think I’ll stick to trying to make cakes for this tea party! I have mentioned the Teenage Cancer Trust Tea On The Terrace, haven’t I? On Thursday, all over the country, folks will be raising money for this fab charity…please click on the link in my main manure to find out more. It’s looking good, weather-wise, thankfully, so we should all be on the terrace, and in the garden. There may not be many biscuits, if any, for sale, but there will be cakes!! The are 4 different types of cakes in the freezer, and I’ll try to get a few more in there just incase! In the meantime, I’m going to wash up this cookie Press and it will go back I to the cupboard for another odd 5 years or so! If any of you are experts at using one of the and have hints or even directions to make them fab, please let me know!! Author thebissonPosted on May 20, 2012 May 20, 2012 Categories thoughtsLeave a comment on Well, I tried! It’s Monday morning again, funny how quickly it comes around each week! It’s so easy to get lost in things that you lose track of time! This Week I am going to make a list of everything I need to get done for the charity Tea Party I’m having here next week for Teenage Cancer Trust. I think I’m on top of most of it, apart from the tea towels…they may have to wait. The one thing I can’t do anything about is the weather! I can pray, but really, The One In Charge has got mor eimportant things to worry about, hasn’t He/She! All I can do is borrow thingies..oh lord! The word has gone! Awnings? Tents? You know what I mean! Those pop up thingies to keep the rain off Grrr! Them! 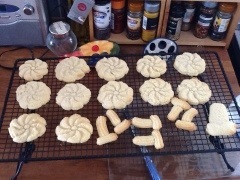 Yesterday I tried to bakebiscuits using a gun to print out the different shape…no, a cookery one, not a bang bang one! I bought it years ago when the children were little, and then they went off biscuits! Now I have got it out of the back of the cupboard and have discovered the recepie given spreads rather than maintaining the shape! Is it cos I used Stork marg instead of butter? I’ll have to experiment. I must also bake some cakes to serve with the tea too! The most important thing I must do first is write some thank you letters to the friends who have kindly sent donations as they can’t come. It’s so kind as they also gave lots when Ally died! So whilst the sun is still shining I will get out pen and paper a so still feel these thank yous should be done with the personal touch… I don’t mean emails aren’t personal, but you can keep paper! So have a great week folks! I’ll let you know how the biscuits turn out! This is going to be a weird blog I suspect! I have decided to detox again… About 4 years ago I totally detoxed and went tea-total for about 2years…it was all in aid of losing weight and feeling healthier, and it worked… For a while. Alas I live with a man who loves wine and a son who is a brilliant cocktail mixer, and I am the type of prison who hates to feel left out! So watching my two having fun with their drinks became too much in the end and I gave in, drank again and so put on loads of weight…not just from the drinking but also I went baof all all those foods I’d been avoiding! Now,here I would like to poin tout I don’t think I was a big drinker… We are talking social drinking, never alone. However I don’t think many bottles remained unfinished once we had opened them! And I know we are not alone in this, and I’m not here to start banging on about the evils of drink or anything! I promise!! I think wine etc can be fab! Its just that I want to get healthier! I’ve hit THAT stage in a woman’s life when everything is changing physically, emotionally, etc and the pounds (well, I say poundes but it’s more like stones! ) are piling on, mainly round my middle!!! Yep, this is the Middle-Aged Spread! Bugger it! For those of you blessed with lovely figures, make the most of them! I long to see my toes again…no, they are not the prettiest of things, but they are mine! I wato to be able to do my show laces up without having to go into an impossible yoga position on the bed/chair to get to them! And I can hear some of you saying I only have myself to blame! Shhhh! I know that, but it really is not helpful to be told that! Especially as some of you have smug looks on your faces..yes, you do! So here I am, back on the hot water and alemons of lemon, maybe a herbal tea, and the head is beginning to go fuzzy and hurt a little. At least this time I know it will pass quite soon and then I shall feel so much better! All I have to do is resist that glass of wine that Hubby will offer me tonight, and not resent his enjoyment of it! Did I mention he’s Thin and Athletic?? Anyone out there young enough to remember the childhood rhyme about Jack Sprat and his wife? Hm! Right, this won’t get my cottage cleaned and prepped for the new guests this afternoon! I do hope the weather clears up for them!! Bye for now folks, have fun!